Take a family vacation in the Pacific Beach/Mission Beach/Bay area without paying a fortune! This fully furnished vacation rental doesn't have the view of a place on the water, but it doesn't have the price tag either! And the beach is only 4 blocks away! Centrally located and only near the Zoo, Balboa Park, Downtown Gas Lamp District, Old Town, Sea World, Mission Bay & of course the BEACH! Enjoy this spotlessly clean, comfortable, family-oriented apartment with oak hardwood floors. 2 bikes, beach towels, chairs and umbrellas, body boards, sand toys, and gas BBQ. 2 laundry rooms. Park your car in the private garage & walk to local grocery stores, shops, restaurants & beaches. Unlimited phone calls within USA and Canada, cable TV and internet with WiFi. 3 queen beds and a double sofa-sleeper in lvrm. 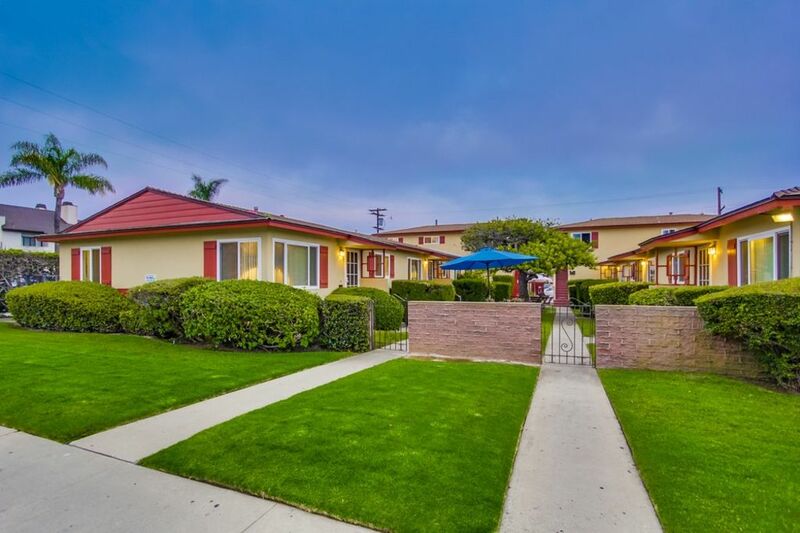 Large groups, we have 3 more 2bdrm apts in this 4-plex and 20 more nearby. See our other listings! We go the extra mile for your enjoyment! : * The ocean and bay boardwalks are wonderful for bike riding so we provide beach cruiser bicycles for you... just like the ones you rode as a kid. No fancy gears, just a plain bike with a wide comfortable seat, high handlebars, kickstands, and back-peddle brakes. * Relax at the tables and chairs in the grassy courtyard and enjoy a cold beverage after a day of sightseeing. You will find everything you'd expect to have in a home away from home. If we don't have it, let us know and we'll get it! * Henry's Organic Market and Trader Joe's are less than a block away. Restaurants, bars, clubs and shops are plentiful in PB which gives you plenty of activities if you don't want to sit around. Everything you could need for your stay is within a 5 block radius... just park your car and enjoy the best of what San Diego has to offer. The ocean is 5 blocks to the west, with lifeguards, showers & toilets. You can also rent children's bikes with helmets (a California law) just down the street. ASK us if this unit has AC! toilet, combination tub/shower, Nice tile work! toilet, shower, Nice tile work! Both bathrooms are in the hallway between the livingroom and the bedrooms. 3 Beach Cruisers with a come along (bike attachment for kids, turns reg bike into a tandem). There are 8 bikes total at this property, please contact us if you need an extra bike for your stay. ASK us if this unit has AC! Inexpensive coin-operated laundry rooms are located on the premises. We choose to stay here because of the price factor (it was not less either paid close to 3k for 7days).. God knows why price jumped 2-3 folds for the duration of stay we choose.. Its a small 3bedroom decent size for small family. Drains were mostly slow. Very small parking, road side parking always full, noisy coz of nearby pubs, very small barbecue place.. can be used only by one small family...There were better built and well maintained house for these price. No satisfactory reasons for the price paid... other than the price, place is just fine for some one in budget and likes to party.. Thanks for your feedback. We apologize that the accommodations did not meet your price expectations. We have fixed the slow leaking drain. We have a strict NO party policy and good neighbor policy at all of our properties. Thanks for your feedback. This rental is located in a prime location, close to everything, and because of that, the area can be a bit loud during the busier seasons. You stayed with us around spring break time and that time attracts more crowds to Pacific Beach. Our apologies about the pull out couch, we have not heard such severe feedback about the bed. We will check it out immediatley and assess the situation. The unit has had a deep cleaning since your stay. We are happy that we were able to provide an extra cleaning service when you called about your dissatisfaction about the cleanliness of the condo. The bicycles are located in the garage. I don't see that you contacted us to ask. The information is in the Orientation Guide. We replaced the pans and pots, thanks for the feedback. We do not provide cooking oil, our apologies. We ask that you leave the house like you might leave your house when you travel. We ask our guests to please do all their dishes and take the garbage out. Yes, there is a cleaning fee, but since we do not have the capabilities of a hotel cleaning staff we ask our guests to leave the rental in good condition upon their departure. We hope that you enjoyed your time in San Diego. Great place. Family had a lot of fun. Family had a great time. Went to the beach everyday. Thanks Roman! We are happy to host your family for a future stay. The place is okay for the price and being a bit older. Not great water pressure. Beds and pillows not that great but okay. If you stay here you need to be aware that there is a tavern very close by and the music is very loud until 1:30 but then as the people are leaving the bar they are loud and very foul mouthed. If you are into the party scene then this place might be okay for you. We did walk to the beach but felt is was a rough part of town at night but okay in the day. The company that manages the property is very helpful, cheerful and tries to fix and problems quickly. Because we had a larger vehicle it did not fit into the garage but we had no trouble finding street parking. I would not stay here again but it is an okay place to rent if you just need a place to land. Just a great Place for to stay in PB. right in the middle of the Place going everywhere by bike or foot.! We happened to stay here during one of the hottest weeks on record in San Diego. It averaged 98 all week. When we arrived, we opened up the door and all the windows had been shut for a while so the apartment felt like 120 degrees! It was miserable. To make it worse, the pilot light was out on the stove and the whole place smelled like gas. It took a full day to get the smell out with all the windows open. Fortunately there were a bunch of fans in the closet that we could use, but it was still miserably hot. Another thing that made the stay miserable was that the apartment is less than 500 feet from three major bars that are open way into the night. 50% of the nights we were there they each had incredibly loud music booming and lots of drunk college kids mulling about and talking/yelling loudly until all hours. This might not have been too much of a problem if we could have kept the windows shut. But because it was so hot, we had to have the windows open. For 4 of the nights we basically just didn't sleep due to the noise. The only thing that let our kids sleep was a single fan that was provided that was extremely loud. So it drowned out the bars and provided really loud white noise that they could sleep with. Those of us in the other bedrooms didn't have that luxury. Overall, the inside of the apartment is fantastic. At least that was a plus. But the fact that the management didn't think to air the place out or even check on it (where they would have noticed the gas smell) before we got there is outrageous. Although their customer service during our stay was otherwise excellent, the noisy bars made it so I would never stay in this particular apartment again.